The Snapware Airtight 29-Cup Rectangular Food Storage Container with handle is perfect for storing prepared foods and keeping them fresh. An airtight, leak-proof lid with 4 locking tabs opens and shuts easily. Just remove and wash each gasket before use for optimal results. An oversized handle makes the container easy to transport to tailgate parties, picnics, and more. The BPA-free polypropylene container and lid are microwave, freezer, and dishwasher (lid top-rack only) safe. Snapware plastic products come with a limited lifetime warranty against manufacturer defect. 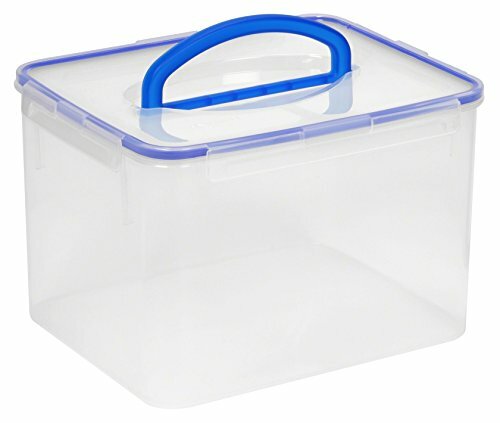 Snapware Airtight 29-Cup Rectangular Food Storage Container is perfect for storing prepared foods and keeping them fresh. Airtight, leak-proof lids with 4 locking tabs opens and shuts easily. Remove and wash each gasket before use to optimize seal. Oversized handle makes the container easy to transport to tailgate parties, picnics, and more. BPA-free polypropylene container and lid are microwave, freezer, and dishwasher (lid top-rack only) safe. Snapware plastic products come with a limited lifetime warranty against manufacturer defect.